Poll: What do you think of the mod name? I'll implement that hopefully in the next update. Thanks for your input! What would you guys like to see more of in the next update? I'd appreciate it if you'd choose something that you would like in the next update in the poll up above. Thanks! Maybe you could add a config, and one of the configurable thing is the spawn rate of the dungeon. 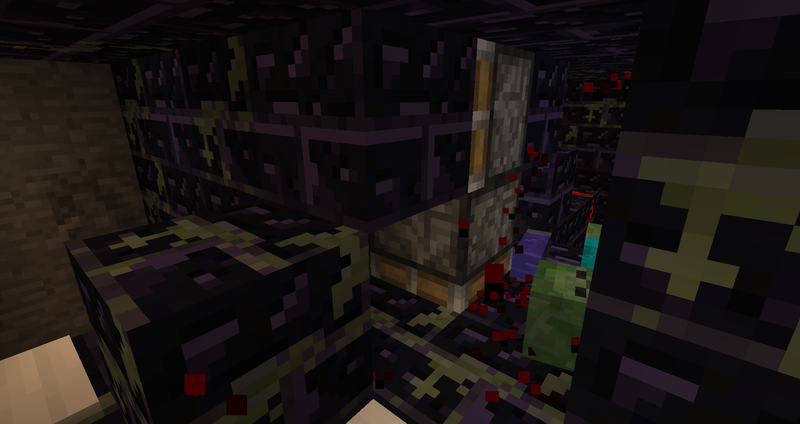 I found the dungeon to spawn too frequent every time I create a new world. Good idea, I'll work on that! Thanks! This looks nice, I haven't downloaded it, but I like the way heavy armour makes you walk and mine slower but hit harder. I say keep the dungeon loot overpowered as it is, but buff Herobrine. You could make him: strike lightning at players, have more health, be immune to fire in case people use fire aspect swords, be immune to potions in case of damaging or poison potions and make him regen. He is immune to fire already. Or else he would die in the lava fountains in his dungeon. You should add another config option that could enable or disable boss bar to appear when you're near herobrine. I felt kind of annoyed when I start a new world and suddenly the sky turned purplish because herobrine is nearby (I already had a minimap mod so it's easier to track herobrine ). Also, I found another problem. Even after I killed herobrine and then after a minute the boss bar appeared for a moment and then it disappear. It goes repeatedly (like every 40 sec it reappears). When it was reappearing, were you moving around on surface at least, oh, maybe 50-100 blocks? Because, if that's the case, then you probably found yourself another dungeon. I want to make them less common, though. I've also been considering removing the boss bar completely. I'm working on adding new effects to Herobrine, among other things, and I was wondering if you guys had any ideas on what should happen when he takes damage. I want him to spawn something, though I'm not sure what yet. If you guys have any ideas, feedback is extremely appreciated! Well... this new pickaxe destroy's pretty much the point of enchanting. Herobrine is really easy to defeat, even tho he is suposed to be the worst enemy alive in minecraft. I won't even talk about the other items and the vanilla properties of obsidian that were ignored in this mod. First of all, I made my point in case he wasn't doing it for fun. I never said nothing about the code... I actually find it ok, nothing is really laggy for my pc and I only have an i3 and a AMD Radeon. I actually code but even if I didn't that doesn't make my point pointless. I wasn't rude, a critic is a critic, If he wants to accept it he can, if he doesn't, that means that he is focusing his mod on other stuff, it's HIS mod not mine. Being rude is telling people to shut up, just because they don't know how to make something that they are criticizing. That's not even a point, that's childish and wrong. Giving an opinion is what I did, next time try to understand the difference before taking that kind of position. Also, if you don't want people to be rude to you, don't create another rude person by doing so. Thanks for your input, I appreciate your feedback. I know that I still have a lot to work on, but in the next couple updates, I'll be adding a lot more aspects, so stay tuned! New update coming soon, stay tuned, everyone! If you go into survival, is he still hostile? And yes he is hostile.